Filtering out the qualified customers from the less qualified is a hard task to begin with! But the job is well taken care of by the sales funnel. 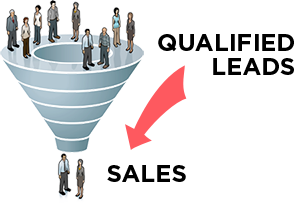 Sales funnel/pipeline acts as a strainer to direct qualified buyers through the sales process. In fact, at the top of the funnel is where all the website visitors are (qualified, less-qualified and unqualified). The unqualified drop at the top, even before they move on to the next step in the funnel process, less qualified drop away at each step of purchasing process, and only the qualified make it all the way to the bottom of the funnel. At Creately, we normally use funnel diagrams to understand the flow of a user through our website, to the application, and then onto the purchase pages (or not). Some great tools are out there to measure, but we use Google Analytics to understand our funnel and conversion rates. We actually went and applied the same to our traffic funnel in three steps. Identify how our potential customers find out about Creately. The ‘trigger’ to visit the site. What their motivations are. Why are they here? Identify the pages they land on, and craft a message that resonates with the visitor’s intent and motivations. This will achieve lower bounce rates and far better conversions in a funnel. It’s easier to map this out in a diagram - a simple flowchart, and here’s ours, How People Discover Creately. Some of the bounce rates are guesstimates though. We first identified the source for them to come to Creately, then we broke them down by their motivations and where they would go on the site to what landing pages. We refer to the whole logical sequence as a funnel. Now, how do you like our use of flowcharts in analyzing our sales funnel? If you're convinced, try it out for your website now!